It’s hard to believe that this is the only episode that was written by Ray Bradbury given his standing in the science fiction world. I actually read his short story of this episode long before I ever saw it, and the episode here is a good one, though lacking the real depth of Bradbury’s descriptions. What is easy about it is that it doesn’t have a time factor about it. Everything looks like it is set in the current day (circa 1962 of course) but with the technology available to build a robot that is in human form and has the ability to do and act as humans do. I like that aspect. 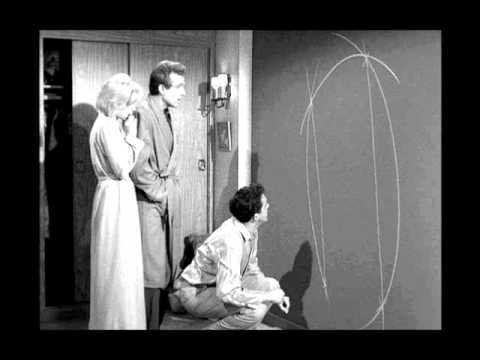 The story concept is simple, but it is also effective, and that’s what makes the best Twilight Zone episodes. It takes a believable concept, gives it a bit of a shake, and turns it into a watchable show without too much flesh being worked out. Perhaps it is a little schmaltzy at the end, but the right things have already been done to make it a worthy one. 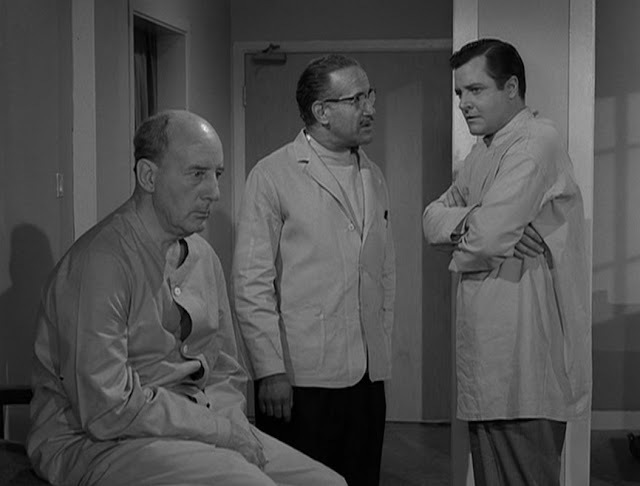 I can openly admit that this is an episode of The Twilight Zone that should be avoided by anyone who is delving through the series for the first time. It has its place, and no doubt there are many out there who will enjoy it, but I find that it is terribly silly, and almost ridiculously out of joint with most of the stories. Even for The Twilight Zone, it is a bit much to expect us to believe that a man who has gotten married just twenty minutes earlier can then come back to his dead mother’s house, only in order to finalise the sale and then head off on his honeymoon, will suddenly become entranced in the things of his past, and regress to a state of his nine year old self, as well as finding his mother there again to molly coddle him again. I mean… yeah… the degeneration to a child and the re-appearance of your dead mother is a bit of a Twilight Zone-ish tinge about it… but I don’t buy it as a viewer who is looking for more than that from this series. Add to the fact that none of the characters are likeable makes this a hard grind episode to dredge through. I’m pretty sure that anyone who watches this episode will be able to predict the storyline from cover to cover. 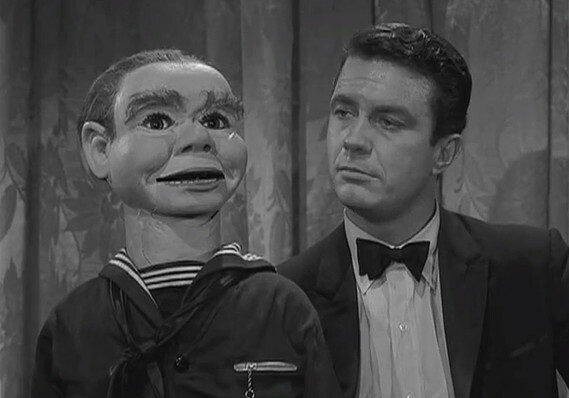 That’s not to the detriment of the episode, because it is acted well by Cliff Robertson as Jerry Etherson, the ventriloquist with his dummy Willie, who does seem to be more than just a stage act. Perhaps the only downside of the storyline is that there are any number of opportunities for the character of Jerry to escape from the hell that surrounds him, not the least being just chop the crap out of Willie and burn him until there are nothing but ashes left. Of course, that’s not how the story is supposed to progress, but each time a chance to escape arises and it isn’t taken, the more frustrating it becomes for the viewer. 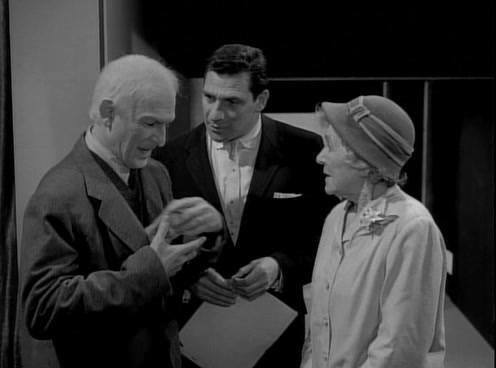 The final twist, what Rod Serling himself calls “the old switcheroo”, is a fair enough conclusion, but it seems to be a little rushed, and probably doesn’t do justice to the lead up. It was an album that captured that time of my life, and it never ceases to bring it all back to me when I listen to it, especially on muggy November days, which is how I remember those days back in 1986. The HSC had sort-of started for us, but it was still the end-of-year excitement and joy that I remember with this album. Back in the day when our youth allowed us not to care about anything in particular, except our own passions. The laughter of the antics at our hangout at school, and in subjects such as Ancient History with Russell Parkin. My obsession with cricket, playing at school, practicing after school, and playing all weekend. The love of discovering new music and sharing that around. 16, 17 and 18 were some fun years. A long time in the past now, but they still flood back when I put this album on. It’s funny how the subject matter of many of the songs, dealing with such elements as time, actually corresponds so heavily with my memories of this era, and that it has become timeless for me in so many ways. The memories that the whole album wouldn’t fit perfectly on one side of a 90 minute cassette, and either having to put it on a 60 minute cassette and add something to the end (which is what I did, putting the B-side tracks from the “Wasted Years” single on them, Adrian Smith’s “Reach Out” and the humorous “Sheriff of Huddersfield”) or cutting out a song. And the wonderful memory of walking to double games one day, and the question being floated as to which song on the album would you consider the one to leave off in such a predicament. When my answer of “Sea of Madness” came forth, I was ridiculed, and the answer that became folklore amongst us was that I “hated” “Sea of Madness” and that I had said it was the most reviled song of all time. Yeah, great. Thanks Kearo, Bono and Anthony, you can all get stuffed. I just felt like writing this today, on a warm November morning as I listened to this album, reminding me so much of those late days of 1986 when that kinship with fellow classmates was possibly at its strongest, which grew through the next 12 months before we all parted on our life journeys, rarely to be seen together again. Melancholy and happiness rolled into one. Josh and Nic Maddinson's Gloves! Will Selectors Bear the Brunt of Their Wrong Doing? So now that the XII has been selected for Adelaide (without my help on the selection panel), what can we make of the team, and also the selection panel themselves? When you look at those that have missed out, it tells a tale in itself. Both Callum Ferguson and Joe Mennie have been booted after just one Test, and also when the next Test is played on their home ground in Adelaide. What sort of message does this send to those in the Sheffield Shield? We picked them, and they failed in their first shot. Then we told Mennie not to play in South Australia's Shield game, he had to rest. Then we dropped him without a second thought. We also gave Ferguson the flick, despite his experience in first class cricket, and the unfortunate way he was dismissed in both innings in Hobart. You know what that suggests? This is a selection panel that has no idea who is going to perform and who isn't, and if their selections don't immediately justify their selection, they'll get dumped and they'll try someone else. That is a dangerous position to be in. A very dangerous position. Peter Nevill is without question the best gloveman in the country. Up until 1999 this is how we chose our wicket keepers. If they scored runs, that was a bonus and a grateful one. Then Adam Gilchrist appeared, and changed the landscape. He was followed by Brad Haddin, who did a similar job on a human level and not a superhuman level. So now it is suddenly expected that no matter how good a keeper you are, if you don't average high with the bat you will be discarded, no matter how good you are. So now we picked an inferior wicket keeper, simply because he may score more runs with the bat, to salvage what the top order has been failing to do. To say it is a disgrace that Wade has been picked in front of Nevill is a complete understatement. And this is the icing - in the Sheffield Shield this season Wade has 113 runs at 28.25. In TESTS this season Nevill has 92 runs at 30.66. This selection has no justification on any level. It is a selection for the sake of change, for the falsehood that one may score more runs than the other, and completely ignoring the fact that the likely more numerous missed chances will be far more costly. More black marks against the selection panel. Joe Burns was also shown disdain, though he didn't help his own cause. Adam Voges is out concussed, which saved the panel the problematic issue of dropping a batsman with a Test average of over 60. Would he have been given the chance for redemption in Adelaide? Given the decisions made around him, it would appear unlikely. A Test career is likely over, and it deserved a better fate. Was Nathan Lyon saved by the fact that both Stephen O'Keefe and Ashton Agar are AGAIN injured at the worst possible time? We won't know for sure, but it just appears that Lyon is untouchable. It seems that risks in selection will be taken with every other position in the side except the long reigning spinner. It is a concern. A big one. So what about the selections to replace them? Peter Handscomb was a given, spoken of for some months as a likely selection, and when the occasion arrived he took it by the horns. He looks a long term prospect. Matt Renshaw did the same, scoring runs easily and competently at a time when an opportunity has arisen. So little is known of him that we will all be watching with interest. Nic Maddinson has been on the radar for a few years, but never really taken a good hold of the chances. His selection smacks of a favoured nation clause with one of the selectors that has pushed his cause through his media commitments for years. His record is only average, but his strength in hitting the ball hard as well as showing a spare arsenal in his part time left arm spin means he has been given his chance ahead of a more likely partner in Kurtis Patterson. Jackson Bird returns, in a reversal of what was said just two Tests ago in regards to his batting. Perhaps that only applies to wicket keepers now. And Chadd Sayers gets what is likely to be another chance to carry the drinks, despite a lack of penetration in the Shield game in Brisbane. So what have we learned? We've learned that the selection panel doesn't know why this team is losing, and that it's solution to this is to throw a whole range of new and old options into the mix, and see if it becomes the solution. To me, it tells me a lot more about the unstable minds of the panel than the problems our cricket team is facing on the field. It all shapes up to be an interesting Test match in Adelaide, where the blame for failure or the credit for success will not lie with the true source. Another viewpoint of the alien-comes-to-Earth theme which is prominent throughout The Twilight Zone, but always with a different slant on the outcome. On this occasion it is again the turn of humans to act as the aggressively frightened, and in the process depriving themselves of the gift that is the title of the episode. It is episodes like this that show how wonderful some science fiction writing can be. It shines a light on the intolerance of many here on earth, but by using outer space aliens as the target instead of “illegal” aliens on our own planet the story can be told without offending those who would commit such acts. The characters here, especially that of the Doctor and the alien Williams, is excellent, though one could suggest that in a real scenario that hopefully the doctor would take a more forceful role in trying to prevent the ending as portrayed here. As many science fiction shows do, this is another example of using a factual line of writing in our own world, but highlighting it by setting it in a science fiction fictional world. An interesting concept that isn’t just a science-fiction story, but mixes it with the virtues of true love and the decisions that will eventually face everyone as they realise they are reaching the end of their lives, together or as one. It would be easy to try and pick apart this story (if the technology of the world as depicted in this episode can transfer the heart and soul of a person from their old body into a genetically engineered body of another, why haven’t they just been able to cure disease instead) but that would be unfair. Instead, we have a tale of a couple still together and in love after more than fifty years, who want to continue on together. The opportunity of a dual body swap is the answer, but when they only have enough money for one transfer, what is to be done? Gamble to find the money? Only have one person do the swap initially, and hope to save the remainder in time for the other to join them? It’s a fun tale, with a nice undercurrent of the value of true and long lasted love being the winner in the end. Rating: Eternal life for a price. 4/5. Several years ago I sent through my application for a number of positions that had come up as a result of the Argus Report - those being to become coach of the Australian Cricket Team, to fill the new position of General Manager of Team Performance, and to become Chairman of Selectors of the new National Selection Panel. Unfortunately, you chose to overlook my applications for all three positions. I think on review of our current situation in Australian Cricket, that you will agree that that was a serious error in judgement on your part. With the resignation today of Rod Marsh as Chairman of Selectors, I again put forward my application to fill this role, and return Australian Cricket to its rightful position as the finest cricket nation on the planet. Obviously we all understand that the selectors can only choose the players to be a part of the team, and cannot be held responsible for their actual performance. I can be upfront in saying that this is exactly the line I will be using should the team not improve on my watch. Of course, I don’t expect this to be the case, because I will be enforcing several new measures to ensure that our national cricket teams regain their winning ways immediately. I bring to the table immense experience in both captaining and selecting some of the losingest teams in the history of cricket. No one has captained with such a stunning lack of success on the field, nor been a selector in eras of local cricket club teams that have performed so woefully on my watch. I am generally accepted as one of the finest losing cricketers of my generation, if not all generations. With this amazing track record, I can assure you that all it will take to ensure that I can turn around Australia’s cricket fortunes, is for me to go against every instinctive selection policy I will come up with, and by doing the exact opposite of this, I will be able bring success to our great nation once again. I haven’t played a lot of representative cricket. I haven’t played for my state or country. I haven’t won awards, and I haven’t played on the great grounds of the world. I have tried to make a mockery of myself on social media, and have tried to pick fights with famous cricketers on Twitter in order to have my words slapped back in my face. What I have done is watched a shitload of cricket over the past 40 years, at all levels. I can tell you stats don’t always tell the tale. 200 Test wickets doesn’t mean you are a great off spin bowler who is safe from being dropped. Just because you have taken a five wicket haul and scored a half century does not make you an all rounder. Just because you average 40 with the bat doesn’t mean the five catches you drop and the two stumpings you miss and the byes you fumble can be overlooked and have you chosen as the team wicket keeper. An opening batsman in Tests should not be caught behind in the first over slashing at a ball six feet wide of the off stump. If you can’t pay a forward defensive shot and a backward defensive shot you can’t play Test cricket. It’s not just Test cricket – in all forms of the game we are spiralling, and that is because we don’t play our best team all of the time. Rotation doesn’t work. Resting players doesn’t work. It’s time to pick our best team all of the time, with less changes between players and formats. Obviously as Chairman of Selectors I can’t dictate the program, but I will certainly be airing my views on what should be done about it. It is time to identify the right players now – the ones who have the talent, but also the constitution for the fight, the determination to succeed, the ability to adapt – and stick with them. Build them up, and give them their opportunity. Losing to Sri Lanka was disappointing, being completely outplayed by South Africa is becoming a similar story in Australia, but with major Test series coming up against Pakistan, India and then England, we need to use what little time we have and get our players in order. In essence, I’m your man. Choose me now, and I can assure you that I will take on the difficult, mind numbing and crushingly dreadful job of touring the country and watching cricket at first class and international level from the horribly comfortable private boxes serving only gourmet pies and beer, suffering while being torn away from my wife and children on business class flights around the country and the world, in order to provide Australia with the right team to once again dominate the game. I am willing to sacrifice myself for this. Or, ignore my application again. Of course, if you do, I will be chasing your job in a few short months. Cricket Tragic and Chairman of Selectors Elect. Ah, the old tall tales, and the places they can lead you to. I enjoyed this episode, as much for its humorous content and obvious by-play as for anything else. The fact that it played off the ease with which you would expect an alien posse to be confused as to the most intelligent or popular of human life forms was excellently done. 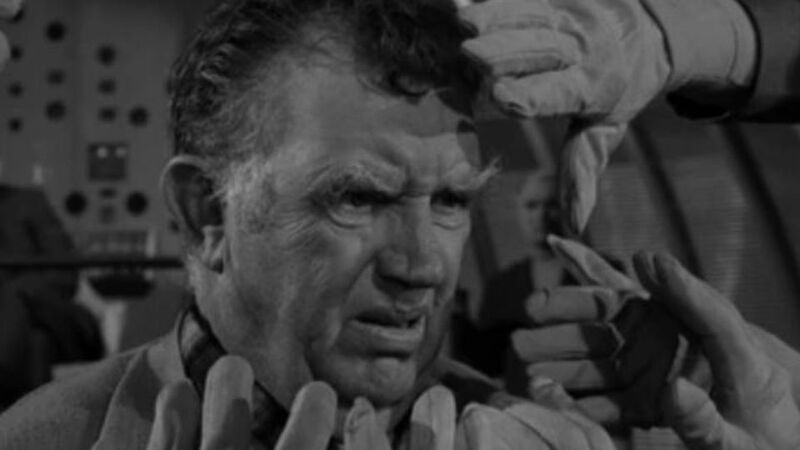 Watching an old pro like Andy Devine play the lead character, who spins tales of untruths in such a way that he almost believes himself that they are the truth was a joy. This combined with the general politeness of the alien beings, and their mistaken ideas of what they were aiming to locate, makes for a fun and easily digested episode. 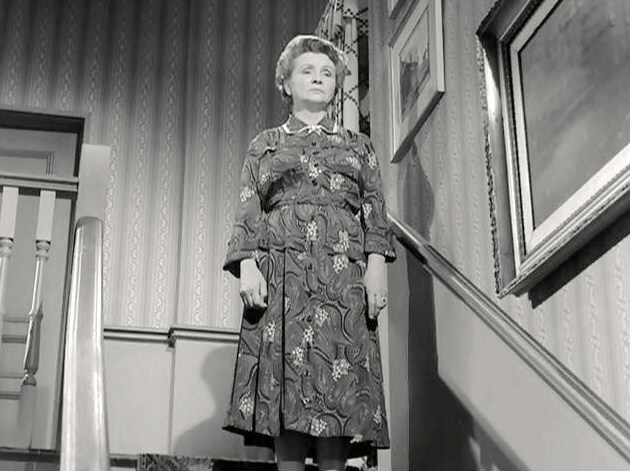 I generally like the one-room-plays that often crop up on The Twilight Zone. In this case, the story becomes a bit convoluted, but it is superbly acted. 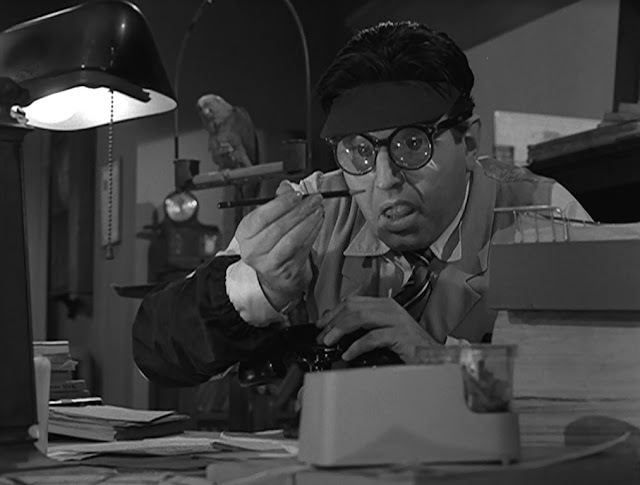 Theodore Bikel plays the protagonist OIiver Crangle, who sits in his office and effectively spies on the people of the world, deciding in his one man jury of those who are guilty of being evil or pursuing evil paths, and then calls the authorities or their employers and campaigns for their sacking or arrest. The acting here is terrific. There is just the right level of madness and craziness allowed to seep through in his manic ideas, especially when being questioned by the FBI agent he has called to inform of his master plan to rid the world of evil. The ending becomes predictable well before it is played out, but it is still done with enough panache to make the episode memorable long after you have finished watching. Rating: The long and the short of good and evil. 4/5. I know this episode has been parodied by many shows in recent years, such as The Simpsons, South Park and Futurama, but it really isn’t a terrific episode in itself, just one that lends itself to being used in other formats. The character of Craig is just a little bit too cartoonish in his manic behaviour, initially showing us in the early scenes that he’s a subordinate who wants the power of being in charge, before stumbling across a race of tiny beings on the rock they’ve landed on for repairs, and then terrorising them incessantly for the remainder of the episode. Don’t get me wrong - the writing of the episode and the character, showing why people who crave power and authority are often completely inappropriate for it, is excellent. It’s just that perhaps it was over-acted to a degree in presentation. 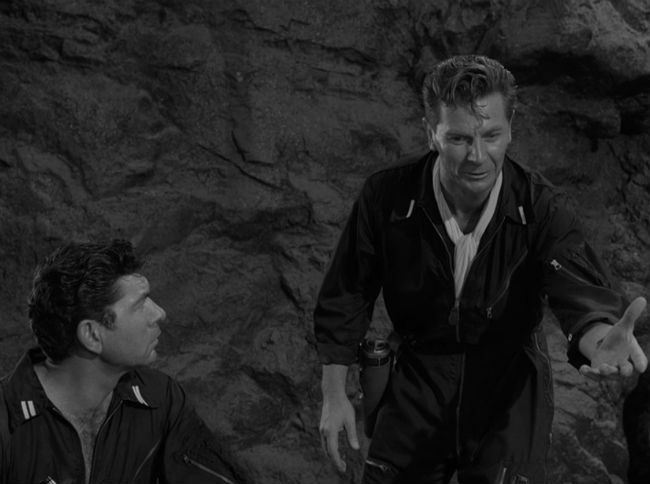 The conclusion of the episode brings about its own justice in a way that only the Twilight Zone can. In the 1980’s, when Australian cricket was perhaps at its lowest point, the selection panel led by the incomparable Lawrie Sawle, realised they had to find the cricketers in the country who not only had the talent, but the strength mentally to be a part of the team, work to the situation of the game, and eventually become great players, even if their records at the time didn’t necessarily warrant selection. From those years, led by a strong selection panel, a coach (a SINGLE coach) in Bob Simpson who was absolutely committed to the basics of batting and bowling, but incredibly strong in the area of fielding and catching, and a captain in Allan Border who was not only one of the greatest ever produced in Australia, but the hardest, gutsiest and most determined batsman I’ve seen, Australia rose to become the best in the world. It’s time to draw a line in the sand and do this again. I’m not sure we have the selection panel currently good enough to do this and stick with this. I think the coach is good enough, but given he has already put 2019 as his expiration date, we need his replacement to be in the system now (yes that should be Justin Langer). And while the captain may not be as savvy on the field as other recent captains, there is no doubting his passion or his determination in a fight. Following the debacle that was the Test tour of Sri Lanka, and the one day of dominance in Perth, followed by five days of decimation, these performances have given selectors, players, coaches and fans alike plenty of time to dissect what is happening in Australian cricket, and what should be done to start to build the team once again. Is it really that difficult? Is it really such a tough task to pick players who are tough enough mentally and good enough technically to play their part in the side, as well as being of a standard in the field that they aren’t embarrassing? With the Australian season set out as it is, the remaining four Tests are all played out in the next eight weeks, after which the ODI’s are played before the Test team tours India in late February through March. In essence, no matter what is to happen through the course of the remaining three days of the Test in Hobart, the selectors have to accept that five consecutive losses (should that occur) is unacceptable, and that the right players with the right constitution need to be found. I’m not a selector. I am a fan, and I’m a tragic. I love this game, and I like to think I have some worthwhile thoughts on it. I think Shaun Marsh has had his chances and is too injury prone. I don’t think Joe Burns has the defence to be an opening batsman, and may have thus burned his chances of a middle order spot. As much as I admire Usman Khawaja I think his technique of no foot movement as well as his fielding are a liability. I think Adam Voges has had a great run, and copped a pearler yesterday, but it is time to look elsewhere. I think Mitch Marsh has a future, but only if he can prove he can score runs at first class level. I think Nathan Lyon is a liability, even though he gets all the donkey work on the most unresponsive wickets. If we are going to lose, then let’s at least get some kids into the team and give them the chance to develop in the way they were in the late 1980’s. The following is a list of those players I would be pushing. None of them average over 40 with the bat, or under 30 with the ball. But they all have qualities that demand investigating and encouraging. Cameron Bancroft. Age 24. An opening batsman identified two seasons ago as our next opening bat, who has been kept on ice ever since. His technique and temperament appear to be exactly what Australia needs at the top of the order. Peter Handscomb. Age 25. Top order batsman with good technique and equally at home against pace and spin. An excellent fieldsman and with leadership qualities as well as a back up keeper he looks a good prospect. Kurtis Patterson. Age 23. A century on debut at 18 years of age, and now beginning to show the consistency that opens eyes. Much better defensively and temperamentally than his NSW contemporary Nic Maddinson. Looks a likely number five. Ashton Agar. Age 23. Shone on debut with 98 at age 20, injury has curtailed his development. Has shown excellent progress with his batting, but it is his left arm orthodox that is what is most required. Ten wicket haul in Sydney last week should have him firmly in selectors sights this summer. Chadd Sayers. Age 29. Almost a veteran, but his constant and consistent wicket taking must have him securing a chance sometime soon. Why not with the pink ball in Adelaide and Brisbane, where his best qualities as a seamer will work best? Marcus Stoinis. Age 27. Outside of Mitch Marsh and Moises Henriques, Stoinis appears the best bet in the allrounder category. Has opening the batting and bowling in first class cricket, and while he also is not a genuine all rounder, his batting appears a strong point that could develop while maintaining a handy presence with the ball. Pat Cummins. Age 23. Everyone has been awaiting the return of Cummins, and if he remains uninjured during this season, and gets the overs under his belt that he needs, then it may be time to unleash him finally in the five day format. Adam Zampa. Age 24. With Fawad Ahmed, somewhat unbelievably, having been discarded from the selectors notebooks, and Cameron Boyce becoming a short form specialist, Adam Zampa is currently the best equipped leg spinner in the country to be pushed as a Test bowler. Averages 55 with the ball in first class cricket, but Shane Warne’s average wasn’t flash when he was fast tracked to the national set up. These aren’t out and out solutions, but it is plainly obvious changes need to be made to find players with better mindsets for Test cricket. When it comes to stories that involving ‘fish out of water’ scenarios, this works for the most part. It allows you to spend the majority of the episode trying to work out what is going on before the protagonist David Gurney does himself. I did like the fact that the story revolves around a man who knows everyone in his world, but they have absolutely no recollection of him. Like David, you try to work out why this ‘prank’ is being pulled, and how it is that everyone is in on it, no matter how small the detail. In episodes like this it works best to imagine yourself in the same scenario. That’s when it gets scary. The twist at the end is somewhat predictable, but at least leaves the subject within the realms of the Twilight Zone rather than giving us a nice wrap up back in the real world. Generally these are the endings, where they are left up in the air, that work the best. There is a danger in trying to portray what may or may not occur in a fourth or fifth dimension, simply because we have no idea what it may be like. In the pages of a book, it is possible because we get to use our imagination – anyone who has read Robert A. Heinlein’s excellent short story “And He Built a Crooked House” (you can read it here) will know what I mean. 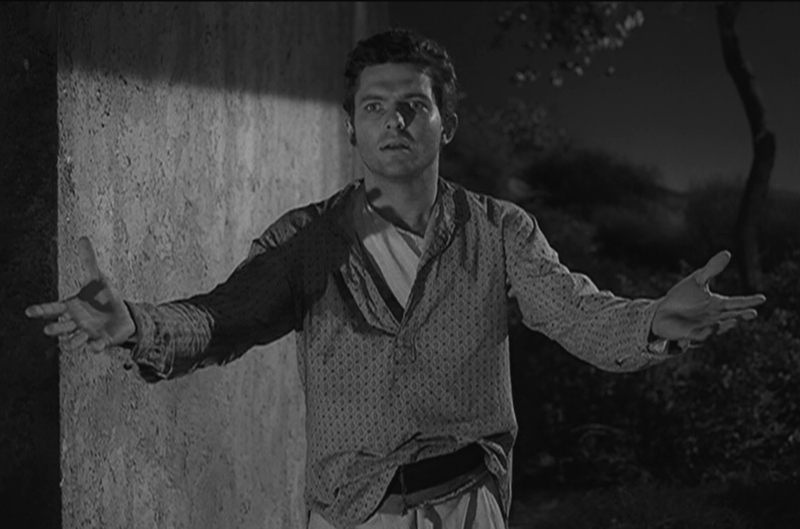 But trying to translate that to the small screen, especially in 1962, is a challenge. The story of a girl who has fallen out of bed and through a portal in the wall of her bedroom to another dimension is done well enough. It is convenient that their friend Bill is a physicist, and his explanations throughout the episode are helpful in tracking the story. 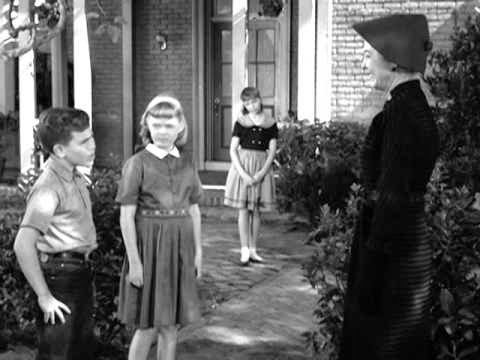 In the long run, the frantic (or less than expected) ministrations of the parents in locating their daughter and then dog seem to drain any real tension from the episode. I’m sure it looked better on paper in Richard Matheson’s original short story.